Every year the Choir nominate a local charity or charities to be the beneficiary of the Christmas Celebration Concert and fundraising sing in Whitehaven’s Tesco and Morrisons superstores and Workington’s Dunmail Park shopping centre. The Choir are delighted to announce that this year’s charities are Alzheimer’s Society West Cumbria, Fight for Life and Citizen’s Advice Bureau. 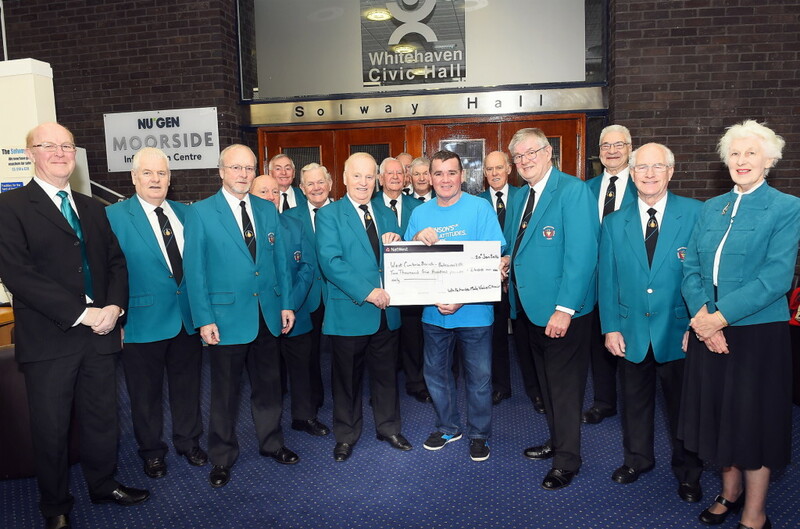 Whitehaven Male Voice Choir are delighted to be returning again to their home town’s Solway Hall for this year’s Annual Concert, which takes place on Saturday 4th June at 7:30pm. The choir will be led by their Musical Director Peter Argyle, with choir accompaniment provided by Joan Johnston. They are excited by the prospect of welcoming as their guest soloist this year, the acclaimed soprano Rebecca Newman. Affectionately named ‘The People’s Soprano’ by fans, colleagues and the media, singer-songwriter Rebecca Newman stormed into number one in the Official UK Classical Albums Chart with her debut chart release in September 2014, outselling new releases by a number of major international stars in the process. In doing so, she has secured her position as one of the most exciting sopranos the UK has seen for a long time! Demand for her eagerly awaited new album was so great that on day one of release Amazon completely sold out following a live studio interview on BBC One Yorkshire and during the week HMV stores up and down the country also sold out. Rebecca subsequently toured with the UK’s biggest selling classical artist, the tenor Russell Watson, on his Up Close and Personal Tour, between March and July 2015, performing to almost 50,000 people. She has also shared the stage with tenor superstar Alfie Boe, with Aled Jones, with Classic Brit award winners Blake, toured with the legendary Welsh entertainer Max Boyce and smash hit vocal group G4. You may have also caught Rebecca on BBC Radio 2, live on Weekend Wogan in July 2015, plus on BBC Breakfast and on BBC1 Songs of Praise. Rebecca’s music is often heard on regional BBC radio, BBC Radio 2 and Classic FM so listen out for her! Rebecca is truly one of the most hard working musicians you could meet. Before her chart success, Rebecca had already sold over 15,000 albums as an indepedent artist, headlined her own twenty date UK tour, appeared on ITV1, BBC1 and BBC Radio, sung the national anthems live on TV for several international televised sporting events and shared the stage with stars like Russell Watson and Aled Jones. With exciting live, TV and radio opportunities being added to the diary for 2016 and beyond, Rebecca is set to be incredibly busy both in the UK and overseas. Her beautiful voice, down to earth nature and her commitment to her charitable causes has won the hearts of many and her eagerly anticipated debut chart release, ‘Dare to Dream’, was named after her own song that embodies the spirit of her musical career. She has teamed up with classical music legends James Fitzpatrick for the orchestral sessions – producer to opera and TV star Lesley Garrett – and Paul Bateman – musical director to international star Sarah Brightman – after working with them for her charity single release in November 2012. Gareth Williams produced the album, from recording to mixing and mastering. Gareth works extensively within TV and radio and has worked on recordings for many of the big stars, including Katherine Jenkins and the Classical Brit Award Winners ‘Blake‘, who have recorded a special collaboration with Rebecca for the album. Rebecca is accompanied on the album by The City of Prague Philharmonic Orchestra and there is also a duet with TV star songwriter and former chorister Mary-Jess Leaverland, and incredible talent who has performed to over 70 million people on Chinese television. Rebecca will be accompanied on the night by her own accompanist. Tickets for the concert priced at (£10 adults), (£8 senior citizens), (£5 Under 16’s) are available from Don Messenger on 01946 63452, or any choir member. In January, the choir presented a cheque for £2600 to John Kane of the west Cumbria branch of Parkinson’s UK. The money was from proceeds of the choir’s Christmas concert and carol singing in local supermarkets. Photo courtesy of The Whitehaven News. This year’s eagerly awaited Christmas Celebration Concert by the Whitehaven Male Voice Choir was a “sell-out” with many followers having to be put on a waiting list for tickets! Those lucky enough to attend had a full evening of first class entertainment – it was good to have pre-Christmas festive sounds ringing around the setting of the town’s Solway Hall. A packed audience was treated to a wonderful mix of Christmas songs and Carols with the talents of Maria Morton and Catherine Marcangelo lifting their spirits even higher. The varied repertoire had something for everyone but without losing the theme of the evening. The Choir themselves were in fine voice with the balance of Tenors, Baritones and Basses better than ever. They captured the different mood of each piece effortlessly, from a pensive ‘Angels watching over Me’ to the very lively and rhythmic ‘Christ Child in the Manger ‘and ‘God’s Choir. Catherine Marcangelo began her Solos with an up-beat arrangement of the ever popular ‘Silent Night’ and had feet tapping to ‘Rockin Robin.’ Maria Morton delighted the audience with her inclusion of Adolphe Adams’ ‘O Holy Night ‘and the moving ‘I know him so well’ from the musical Chess with Catherine, we were fortunate to hear two duets from these local musicians. They joined the Choir in a full rendition of ‘Mary’s Boy Child and had the audience in fits of laughter with the hilarious ’Cat’s Duet’ by Rossini. Of particular note this year was a very polished performance of the Russian Folk Song ‘Kalinka’ with Choir member Marcus Coupe impressing us all with the excellently controlled Tenor Solo and the Choir showing their ability to sing with precision and sensitivity. What a great presentation of the modern John Gardner’s ‘The Holly and the Ivy.’ Superb keyboard accompaniments were provided by Joan Johnston for the Choir and John Marcangelo for the two soloists. The Choir’s Musical Director, Peter Argyle was in his usual role of Conductor and Compere. We had a pleasing balance of Choir, Soloist and just enough audience participation and look forward to the concerts which will follow in 2016.The Choir’s nominated Charity for this year is Parkinson’s UK, West Cumbria.